and stay committed to your goals? Those reasons and excuses were fine then, but they didn’t do anything to get me moving towards my goals. I still have the same goals as before to eat healthy and be fit. I still have the same (if not more) life interruptions. Dance classes, school meetings that I wasn’t told about, days that I get out of work later than planned, bad weather. We all have those times. 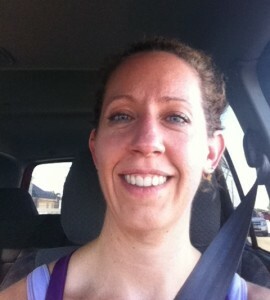 Me Doing The After Workout Drive! So what changed? I changed. I realized that if I want to meet my goals then I have to get creative. I need to work to make sure that I can move things around in order to still get a workout in. Some people suggest getting up early and working out before the day gets disrupted. I’m not a morning person and I found that this just does not work for me. Occasionally if I know ahead of time that I can’t workout at night, then I will force myself to do it but this is once in a blue moon. I try to get creative in other ways. I plan my rest day for Friday since that’s a day that typically is not derailed with meetings or schedule changes. That way if something comes up earlier in the week, I can swap rest day and workout on Friday to make up for it. I also will squeeze in a shorter HIIT workout if I get home late without planning. I burn the same amount of calories in a shorter period of time and it’s fun to mix it up. I cook several meals on the weekends and freeze or refrigerate them so that all I have to do is reheat. That way I don’t have to worry about getting home, working out, walking the dog and then trying to cook dinner from scratch. I just have to reheat after everything else is done. Or, even better, The Kid can reheat on her own without me now that she’s old enough while I workout. I track the calories burned in each workout and I track the calories I eat on most days. This insight has made me realize that I can easily undo all the calories burned with one treat afterwards. It has made me responsible for whether I make a change in my body or if I maintain my current state. I think of all those times that I thought I worked out hard and burned enough to earn an ice cream cone. No wonder nothing changed in those days. I was undoing everything I burned and then some! Reaching goals just takes a little creativity and planning for the unexpected. If things go as planned, then you’re that much ahead of the game. If they go off schedule, you’ve got room to react and adjust. I don’t think there’s a week that something doesn’t go off plan in my life. What are some things that you do to stay on track?